As we continue to see Android and bada powered smartphones coming out of Samsung's camp, we can always be reminded about some of their more humble offerings as it's being seen with their latest device for US Cellular. The Samsung Messager Touch SCH-r630 was recently unveiled and currently available through US Cellular sporting Samsung's tried and true TouchWiz interface. 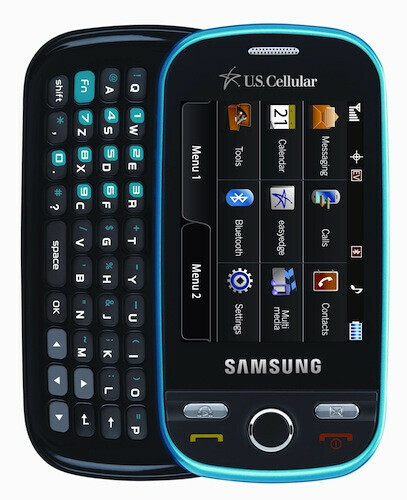 Nowhere close to being garnered as a premium offering, the Samsung Messager Touch features a 2.6” touchscreen, landscape sliding QWERTY keyboard, TouchWiz user interface, Bluetooth, and a 2-megapixel camera. Customers can jump right into the handset without worrying of breaking the bank with its $49.95 price tag with your signature on a 2-year contract. No doubt that the device is oriented towards the younger crowd that prefers the no-talk form of communication thanks to text messaging – plus the touchscreen inclusion compliments it overall appeal for some. I just got mine recently . it is very attractive. I like the touch features. Except with the touchWiz user interface when i pull the icon off of the toolbar it is difficult to get it to disappear back onto the bar. I do enjoy the full keyboard , but i wish there was a touch screen text pad too, like the touch dial. it would probably be a little more convenient. The different home backgrounds are pretty sweet. im having trouble getting the phone to recognize music files from my sd card. .I really do like this phone even though it may have some cons, it has a lot of pros as well. I would recommend this phone to anyone thats looking for a "casual" phone.